Scandinavian Bachelor Pad to Hygge Family Home | Havenly's Blog! When Matthew moved to Denver, he was a high-flying bachelor looking for a sleek city pad. He found the perfect, modern home in a hip neighborhood, and soon decided to make his decor as cool as his architecture. Turning to Havenly, he worked with a designer to create a stylish Scandinavian space inspired by mid-century modern style and infused with geometric pattern and saturated colors. Incorporating treasured heirlooms like a set of Chinese prints and a grandfather’s nautical clock into the design was easy, as the furniture’s strong, confident lines made well-chosen accessories stand out. 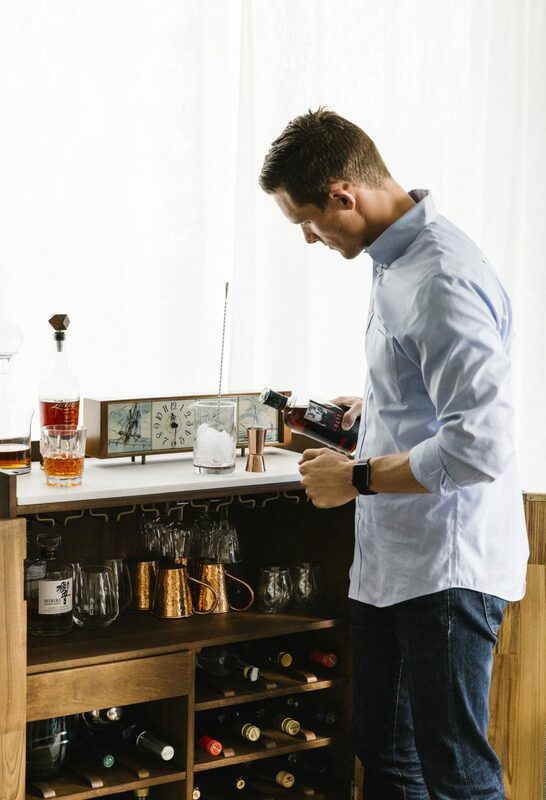 Matthew’s favorite elements of the space include a stylish drink cabinet that’s perfect for frequent entertaining. 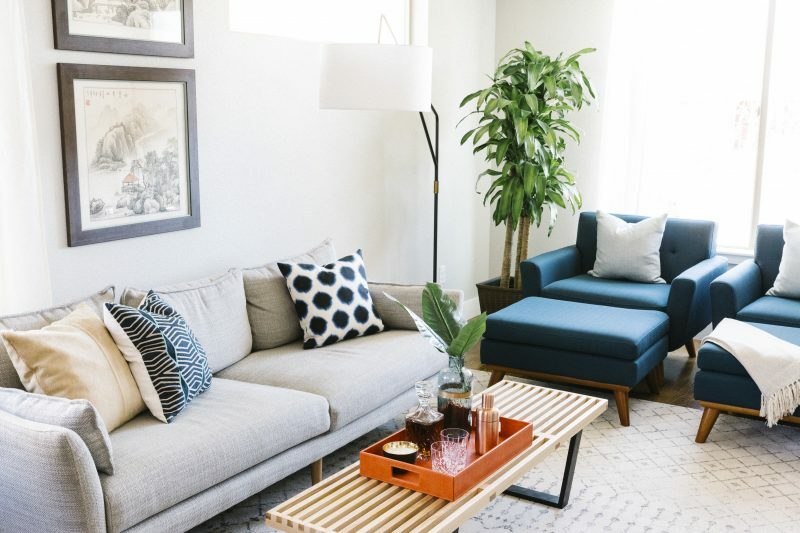 Wood accents were a nod to Matthew’s love of the outdoors, and a coffee table influenced by iconic mid-century pieces looks just-right in the space. For seating, a slim sofa and two statement armchairs make the perfect place to host watch parties for his favorite team. Matthew’s space was perfect for his bachelor lifestyle, but a new phase of life demanded a new look. When Matthew’s new wife Shannon (and her pup Oliver) moved into the home, she wanted to put a cozier spin on the space. After all, her taste ran to the softer and more neutral, and the bold sleek style of the space needed some tweaking. With any couple, combining styles can be a challenge, so Matthew and Shannon again turned to Havenly to execute a refresh of the space that was more in line with their lifestyle. 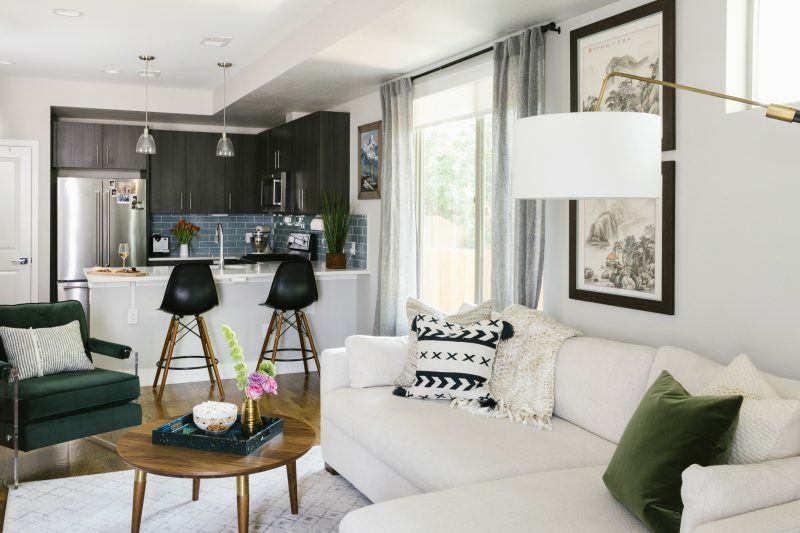 While some elements stayed— artwork and favorite accessories— the new space proves the style versatility of a home with neutral fixtures. Moving away from the space’s hard lines, Shannon and Matthew embraced the hygge side of scandinavian with a plush sectional from Interior Define. Tons of textural pillows and a new accent color (green this time!) rounded out the design. Still, a hint of mid-century stayed in the space with the mixed-material coffee table. Even so, the table’s rounded shape nods to the new softer look. While the new design is definitely a departure, the space hasn’t lost its functionality. 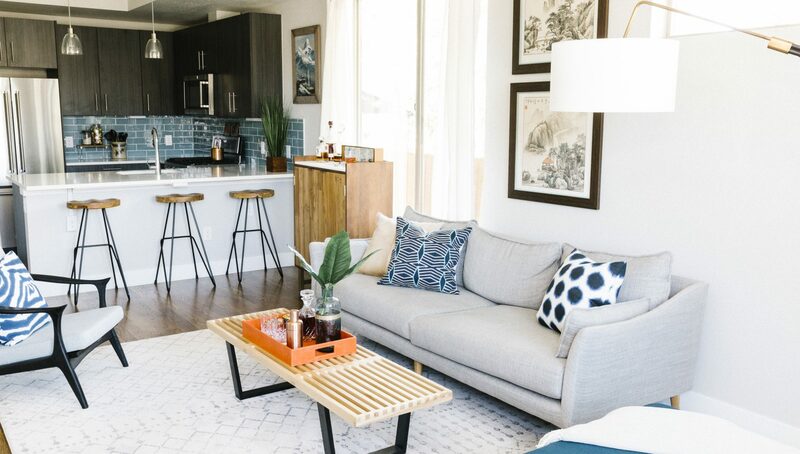 Tons of seating, a bar for entertaining, and a pulled-together feel make it the perfect place to host, whether it’s for game night or a girl’s night. Moving in with a significant other can be daunting: how could two separate styles live harmoniously together? For Matt and Shannon, working with a Havenly designer was the perfect way to find a gorgeous middle ground. Get started on your Havenly project, and combine styles without the drama.